The new Sig Kilo 2000 rangefinder might just be …. wait ...Sig, as in Sig Sauer the firearms manufacturer, makes a rangefinder? Yep, Sig recently got into the optics game in a big way and now makes riflescopes, spotting scopes, binoculars and rangefinders. When I first saw Sig was making rangefinders I wondered if they just rebranded some generic model or actually came up with something new and innovative? Being familiar with Sig Sauer’s reputation I should have known it was the later. Introducing a product into a well established market such as laser rangefinders can be a daunting task especially when competing with big name optics brands like Leupold, Nikon, and Bushnell. However, it is not impossible as Vortex proved a couple years ago. Sig Sauer was smart and used their position as a newcomer to their advantage by seeing what was working, and learning what features hunters and shooters wanted in a rangefinder. Then instead of being hampered by redesigning or updating older models they were able to start with a clean slate and come up with a combination of components and technology that set the Sig Sauer Kilo 2000 apart from the competition. Rangefinders generally come in two versions: simple and complex. The simple models tell you range but often lack the options many users want such as angle compensation or target priority. On the other hand, the complex models offer these features but also have numerous other options such as ballistic tables, reticle selection, bow/rifle/ modes, etc. Often these additional features do little more than clutter up the display and make programming the unit more difficult. The Sig Kilo found a nice balance of useful options while keeping the display and programming simple and not including a bunch of features just for show and marketing hype. This Sig rangefinder comes with a CR2 battery and nylon case, and has its factory settings preset how most people will likely use the rangefinder: display brightness set to auto, the AMR angle compensated mode on, distances reported in yards, and the targeting mode set to “Best”. So for most users no setup will likely be needed. For those wanting to change these factory settings; the display brightness can be switched from auto to one of nine manual settings. Also, the unit can be switched from its AMR (angle modified range) angle compensation mode to LOS (line of sight) mode. Next, the user can change the unit to read distance in meters instead of yards; and finally, the “Best” target priority mode can be changed to “Last” target priority. 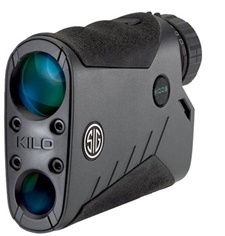 The Sig Kilo 2000 rangefinder comes with 7x magnification and uses a red OLED display which is relatively uncluttered compared to many rangefinders. One of the most unique and innovative features of the Sig Sauer rangefinder is the ability of the user to control the display brightness either manually or automatically. When in automatic mode the Sig Kilo adjusts between one of 20 different brightness settings depending on the available light conditions which it detects with a built in sensor. While the auto mode will likely be the preferred setting most of the time; those who want more or less brightness can select from one of the nine manual brightness options. This is important as the right brightness setting for a particular lighting condition can be a matter of personal preference, so having the ability to change the display intensity to a setting that matches your liking is a nice feature to have and isn’t currently available on any other rangefinder we know of. When it comes to rangefinders the first thing everyone generally wants to know is how far will it range, which makes sense as the primary purpose of a rangefinder is to measure distance. Sig made sure the Kilo 2000 would stand out in this department by giving it a 3400 yard maximum range on reflective targets, 1500 yards on trees, and 1200 yards on deer. As with all rangefinders actual ranges may vary depending on a variety of factors; however, it is safe to say this Sig rangefinder is packing more horsepower than most all current commercial rangefinders including most rangefinder binoculars some of which cost over $3000, it is noteworthy that the Sig Kilo can generally be found for under $500. Like most rangefinders the warranty is a divided into two parts, the optic itself and the electronic components. The optic is covered by the Sig Sauer Infinite Guarantee which is a transferable unlimited lifetime guarantee which requires no warranty card or receipt; while the electronics are covered by a 5 year limited warranty which covers the electronics against defects in workmanship or materials and starts on the date the unit was manufactured. Both warranties are very generous when compared to most rangefinder manufacturers whose electronics warranty often expire in 1 or 2 years. 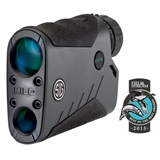 Lightweight compact vertical style rangefinders like the Sig Kilo are generally preferred by hunters that want a small rangefinder they can carry in a pocket or on a belt. However, because of its impressive long range capabilities and 7x magnification, the addition of a tripod mount could allow the Sig Kilo to pull double duty as both a hunting rangefinder and long range shooting rangefinder which are usually the larger heavier horizontal style rangefinders. I’m not alone in this line of thinking and fortunately the long range shooting crowd has already addressed this issue. One tripod adapter for the Sig Kilo 2000 is already available and I imagine more will be likely be available shortly. ​The Sig Kilo 2000 rangefinder has been a big win for Sig Sauer and certainly added much credibility to them as an optics company. Sig showed they knew what they were doing by not only using premium components like an OLED display and magnesium housing but also including the features hunters and shooters wanted like angle compensation and target priority without unnecessary screen clutter or programming complexity. Of course equipping the Sig Sauer Kilo 2000 with a ranging capacity which exceeds nearly all common vertical and horizontal style rangefinders and even most rangefinder binoculars was also no small feat. However, what is most remarkable is that Sig was able to accomplish all this and still come in at a street price under $500. 4.2" x 1.3" x 3"
Yes - "Last" or "Best"